Coleman recites ten Rumi poems and five of his own, accompanied by cellist David Darling. Those were the words of the Persian mystic poet Rumi upon meeting the wild dervish Shams Tabriz. And out of their friendship bloomed many of Jelaluddin Rumi’s most inspired verses. 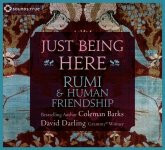 On Just Being Here, the acclaimed poet Coleman Barks joins master cellist David Darling in a celebration of friendship—some of Rumi’s most memorable poems on the subject and five of Coleman’s own—illuminated within the interplay of Coleman’s inspired readings and David’s music. Listen in and let them widen and deepen your senses, like a fresh breeze that invites you to breathe freely and surrender to love in all of its changing guises. I listened this ,so nice and encouraging but guys this is just very little parts of unlimited beauty and greatness of Molana which you call Rumi ,the original Persian poets are incredible and unexplainable,in every part of it,whether he loved Shams or God.